Mr. Foley earned his undergraduate degree at Boston College. Upon completion of his degree in Boston, Mr. Foley returned home to New York to pursue his law degree at St. John’s University Law School, located in Jamaica, Queens. At St. John’s, Mr. Foley developed an interest in trial law. As a third year law student, Mr. Foley competed in and won the Moot Court Trial Competition at St. John’s. 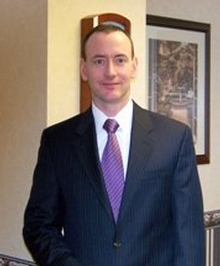 Immediately upon completion of his studies at St. John’s and taking the New York State Bar Examination, Mr. Foley began his legal career as a prosecutor. He joined the Nassau County District Attorney’s Office located in Hempstead and Mineola, New York. At the DA’s office, Mr. Foley was initially responsible for handling misdemeanor crimes such as driving while intoxicated (DWI), assault, domestic violence and traffic offenses. After a short time, he was promoted to the County Court Trial Bureau. In the County Court, Mr. Foley was responsible for handling a wide range of felony offenses including felony DWIs, violent assaults, burglaries and robberies. At the DA’s office, Mr. Foley tried numerous cases to verdict and obtained valuable courtroom exposure. In 1997, Mr. Foley left the DAs office along with this colleague and current law partner, Brian J. Griffin. The firm was originally located in Mineola and moved to the current location in 2008. At the DA’s office, Mr. Foley met his wife, Karen, who at the time was also a prosecutor for Nassau County. Mr. Foley and his wife have two young children and reside on Long Island in Nassau County.